If you're a regular on food blogs or Instagram, then you have probably seen that you can blend up frozen bananas into creamy, dairy-free ice cream or a smoothie. But there's nothing wrong with shaking things up from time to time, so for this recipe we mixed in three kinds of berries that will not only add a dash of color but a sweet and sour edge. 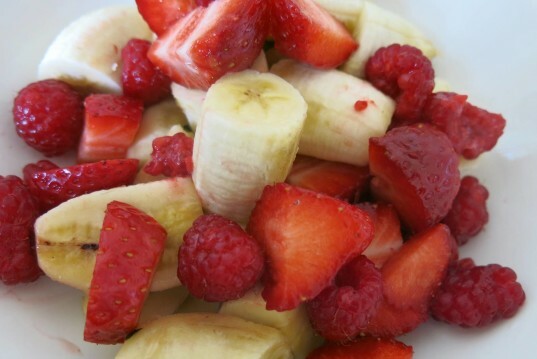 Just remember to freeze ripe bananas overnight and you can blend them away with your favorite choice of berries in the morning for a refreshing healthy start to the day. 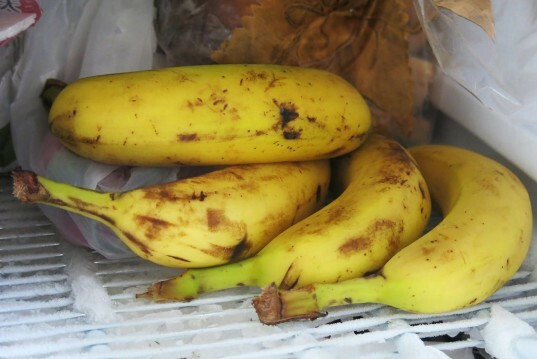 Leave the bananas in the freezer overnight. 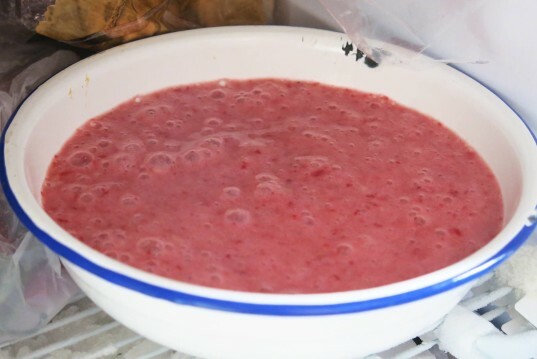 The easiest way to wash the raspberries and strawberries is to soak them in cold water with some drops of vinegar for about 10 minutes, this will get rid of pesticide residue. Always try to buy organic strawberries, as they topped this year’s Dirty Dozen list as the most heavily pesticide-contaminated fruit. 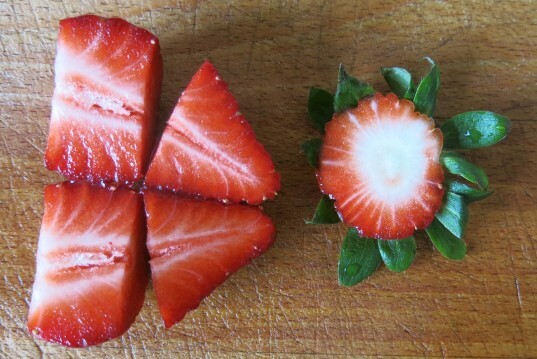 Remove the stem and roughly chop the strawberries to make the blender or food processor’s job easier. Peel and chop the frozen bananas. Peel and chop the frozen bananas. 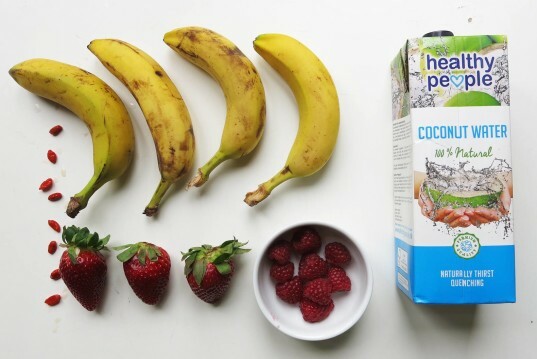 Place the chopped bananas and berries along the coconut water and goji berries in the blender on high speed and blend away. 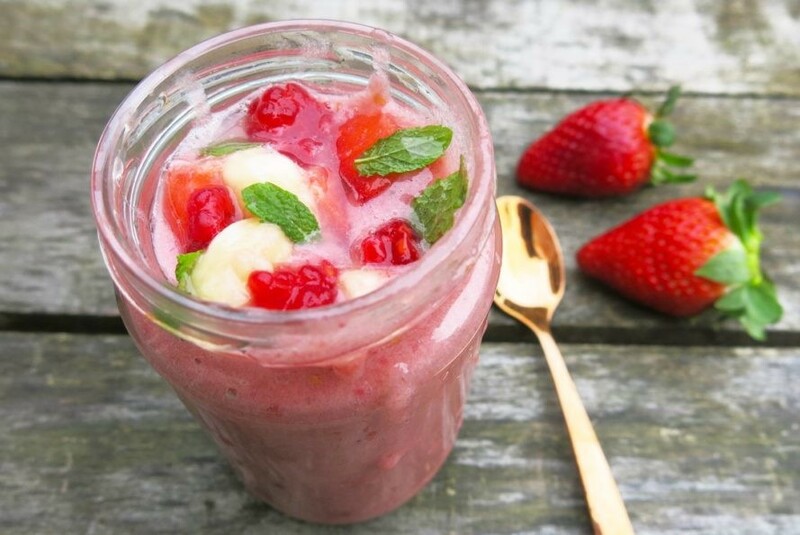 Serve in a bowl or mason jar and top with pieces of fruits and mint leaves. The easiest way to wash the raspberries and strawberries is to soak them in cold water with some drops of vinegar for about 10 minutes, this will get rid of pesticide residue. Always try to buy organic strawberries, as they topped this year's Dirty Dozen list as the most heavily pesticide-contaminated fruit. 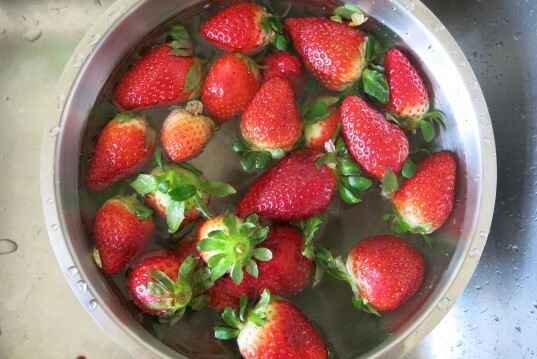 Remove the stem and roughly chop the strawberries to make the blender or food processor's job easier. Peel and chop the frozen bananas.